Sea Buckthorn Insider | Sea Buckthorn Surges in Popularity! The sea buckthorn market is booming, according to the Tribune India. As the need for sea buckthon across the globe grows, the production of this crop increases too. 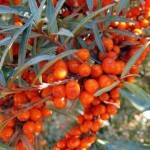 Sea buckthorn is mainly grown in different parts of Asia because the plant thrives in harsh climates. In deserts, in high climates on mountain ranges and on rocky shorelines sea buckthorn can be found thriving. “There is a need for massive cultivation of sea buckthorn by the Forest Department and farmers and supply raw material on the sustainable basis to combat climate change and conservation of soil, water and biodiversity in this environmentally fragile region of the state”. The government is even supporting one company in Baddi, India with it’s first CO2 supercritical extraction unit. CO2 extraction machines create the highest quality oils from the fruit and seed of the sea buckthorn plant. The ability to produce the best kind of sea buckthorn oils could mean much for the economic prosperity of the region. Even the leaves of sea buckthorn trees have wonderful medicinal qualities and one company donated sea buckthorn leaf supplements to the Army in the area. Studies by the Defense Institute of Physiology and Allied Sciences (DIPAS) show that teas and supplements made from the leaves of sea buckthorn are beneficial to people adapting to high altitudes. Farmers in an area called Lahaul-Spiti are preparing to plant over 1,000 hectares of sea buckthorn fields with the hope of producing enough sea buckthorn tea leaves to economically support the small farming communities there. Not only does sea buckthorn provide major health support, the crop is sustainable and beneficial for the people who farm it.